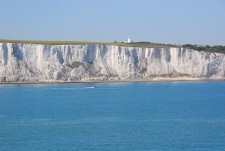 SIGHT SEEING PLEASURE TRIPS OF FAMOUS WHITE CLIFFS OF DOVER. These trips can be arranged all year round, weather permitting. In the summer, weekends pleasure trips leave from the tidal harbour from Dover, easy loading, Secure car parking. Trips can be arranged for any time. Enjoy views of the White Cliffs of Dover and Heritage Coast with a personal commentary given on local points of interest.See the cilffs right from Folkestone all the way down to north foreland. Theres far more to see out from Dover than other local ports. Longer trips can be arranged to cruise further along the coast depending on the weather and tide times on the day at a cost of £65./hour for up to a maximum of 10 passengers. For more information email us or call.